I recently took a group of students to Colorado, the state I’m from. We had a great time, and it made me want to talk about the trip here. So I decided to put up some of my favorite pictures from the trip and talk about some activities that we did. Also, if you feel like seeing more pictures, you can check them out here. 10. Go to Denver. We went to Denver, the capital of Colorado. We walked around town and went to a museum. 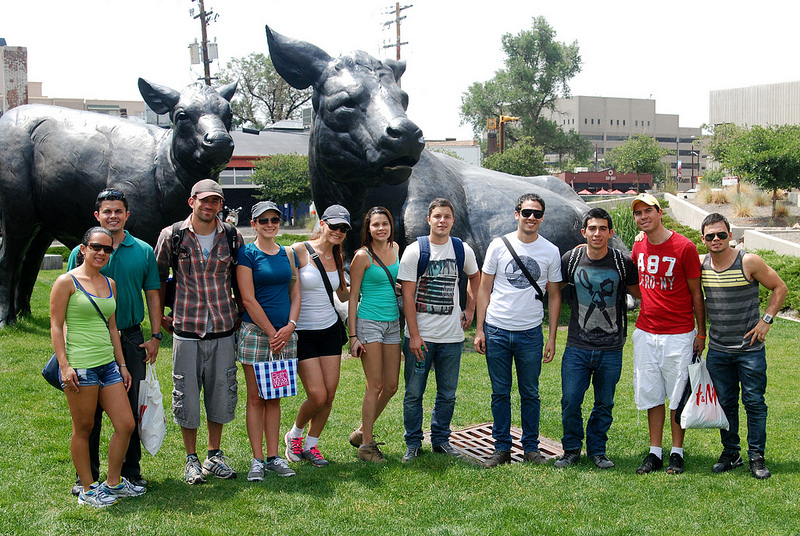 And, of course, we posed for a picture next to some cow statues! 9. Go to the mountains. In Colorado the mountains are close to most big cities. We woke up really early one morning and climbed this rock after a 1.5-hour hike. 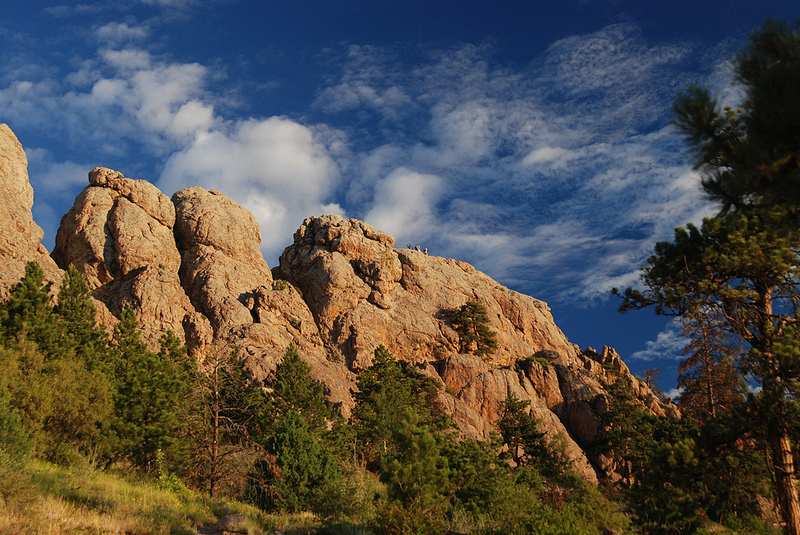 The rock is called Horsetooth because it looks a bit like a horse’s tooth. 8. Eat! 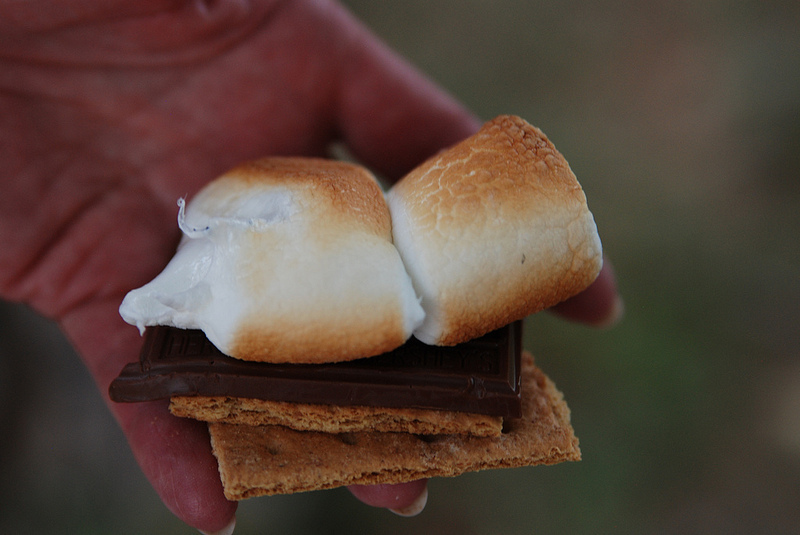 These are called “s’mores,” which are made with graham crackers, chocolate, and roasted marshmallows. They’re delicious! 7. Rock out with your band! This is actually in a new museum in Fort Collins. They have a big section on music, so Kati, Angela, and my mom played the different xylophones. 6. Go camping. We went to a campground near Grand Lake for two nights. 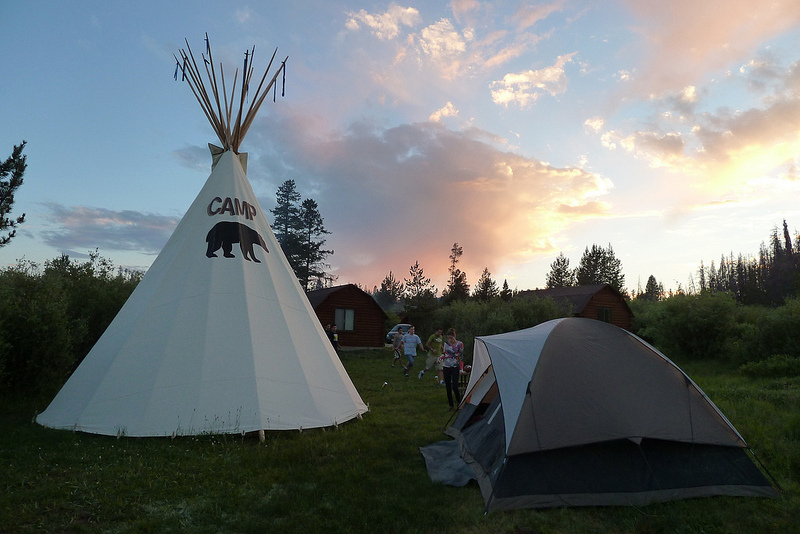 Some of us slept in tents (right), but a lot of us slept in a teepee. We cooked food outside and had a great time! 5. Go hiking. “Hiking” basically means to walk around in the mountains. 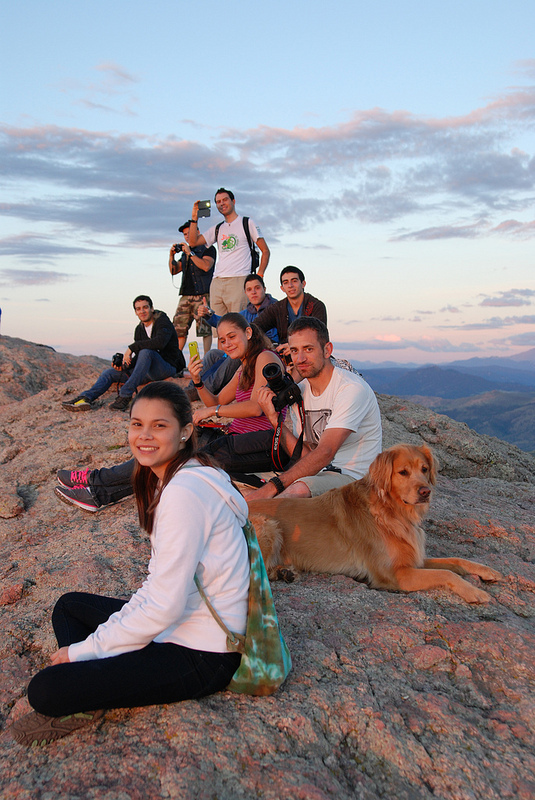 Here’s a group picture on top of Horsetooth Rock at sunrise. 4. Make a campfire. 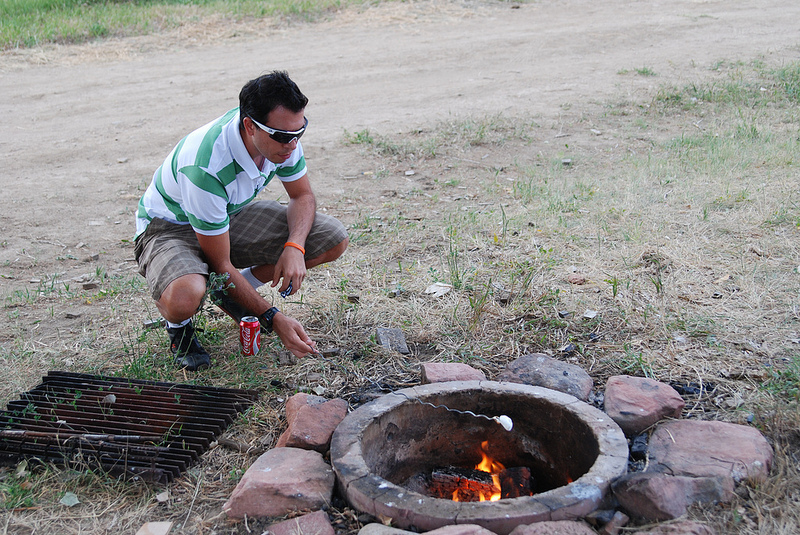 Here Cristian is roasting a marshmallow over a camp fire on the 4th of July. 3. Be patriotic. We were in Colorado over the 4th of July, which is Independence Day. 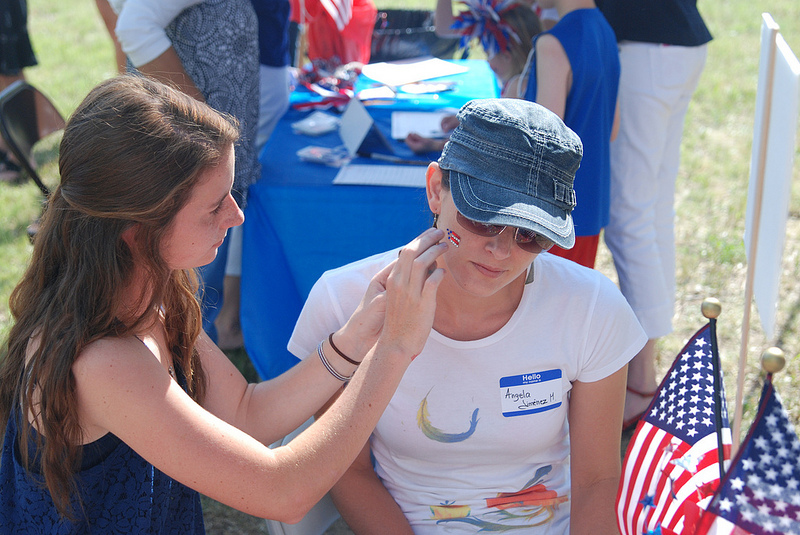 Here Angela is getting a flag sticker put on her cheek at a neighborhood brunch picnic. 2. Go swimming to cool off. It was really hot while we were in Colorado, so one day we went to Water World, a gigantic water amusement park in Denver. 1. Find the snow to really cool off! If you go high up enough in the mountains of Colorado, there are places that have permanent snow (it’s just kind of dirty in the summer). 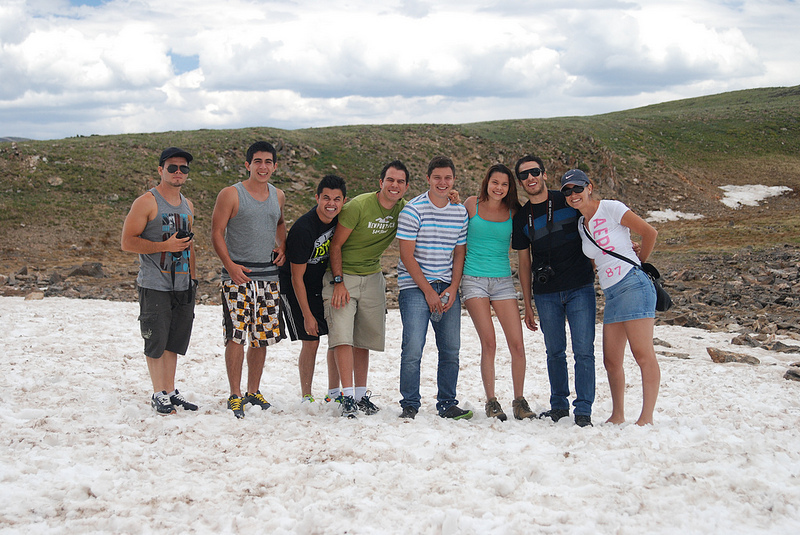 We stopped at this place to check out the snow and have a little snowball fight. Bonus! Go biking! There is a bike rental kiosk in Fort Collins that loans out bikes, so we rented bikes and went on a tour of Budweiser and a few other famous breweries in Fort Collins. It was a great day! So that’s it for now. That’s also why I’ve not written any posts recently, since I was busy planning for the trip. I hope you learned some new vocabulary, and maybe it even inspired you to visit Colorado, or at least to get out and try some new activities!